The National Print Museum’s permanent exhibition was re-opened last week by Minister Deenihan following a revamp. It is joined by a photographic exhibition called Analogue. 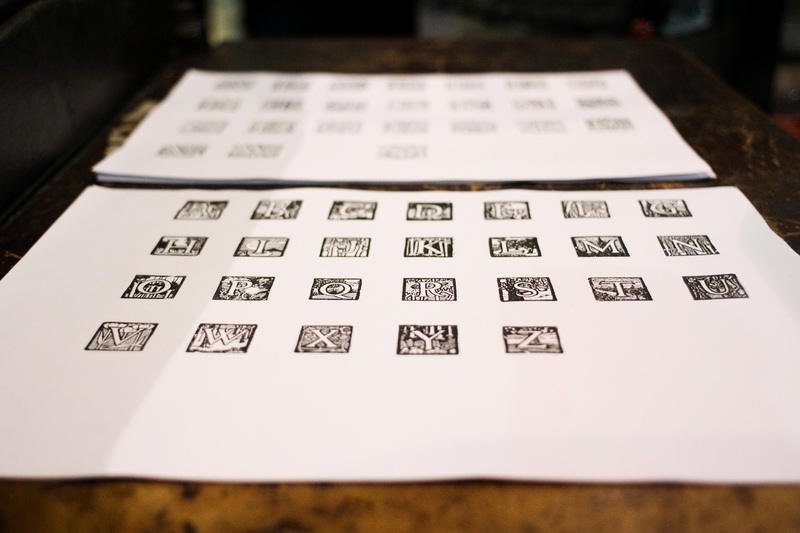 The National Print Museum works to preserve printing material and artefacts (including a replica Guttenberg press) as well as printing traditions. The museum manager Carla Marrinan says that the new exhibition allows the history of printing to be ‘more accessible than ever’. The museum runs a number of workshops which can be taken by the public and which teach and explore traditional printing techniques including bookmaking, papermaking, batik (the process of dyeing fabric), calligraphy and linocutting. The Museum also runs a lecture series which will begin again in September. I was in a book club a few years ago (that regrettably died) and one of the books we read was Raymond Chandler’s, The Big Sleep. Written in 1939 the book introduced the Private Detective Philip Marlowe, surely the coolest fictional private eye. The book begins when Marlowe is hired to uncover a blackmail plot against General Sternwood, a wealthy but very elderly man with two beautiful precocious daughters. The eldest daughter was married to an ex-IRA leader who had left Ireland in the 1920s. I was surprised and delighted to discover while home that Christmas that Raymond Chandler (b. 1888 d.1959) had spent some time in Waterford city during his childhood. The above is a plaque from outside the house which is located behind Christ Church Cathedral, in Cathedral square. 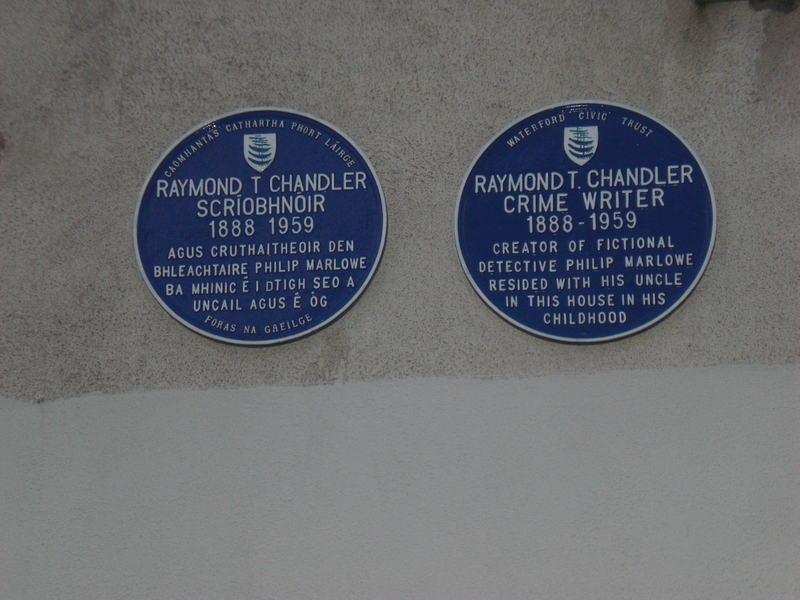 Chandler’s father and brother ran a legal practice in the city and when Chandler’s father (Maurice) emigrated, his brother (Ernest) stayed in Waterford. Chandler was actually born in Chicago on 23 July 1888. When his father died his uncle became an important benefactor for him and Raymond spend many summers in Waterford. Chandler does not seem to have warmed much to his Waterford family, however, and he seems to have found his uncle’s house rather cold. He preferred English society and retreated there when possible. Nevertheless, the stories which he heard in Ireland his connection to the country must have prompted the creation of some of his characters. There is a longer article on Chandler and Waterford in the local Waterford newspaper, the Munster Express. 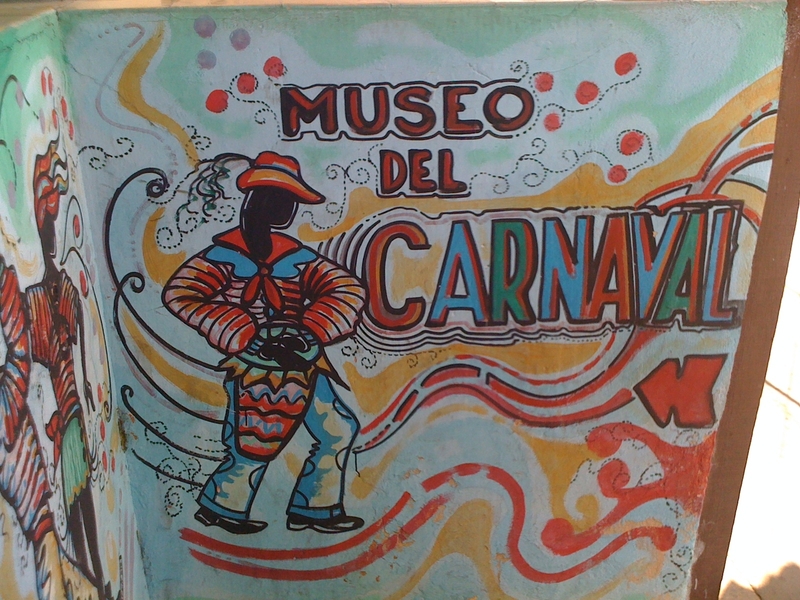 I was lucky enough to spend two months in Cuba last month and part of the trip was spent in Santiago which is known as ‘Birthplace of the Revolution’. 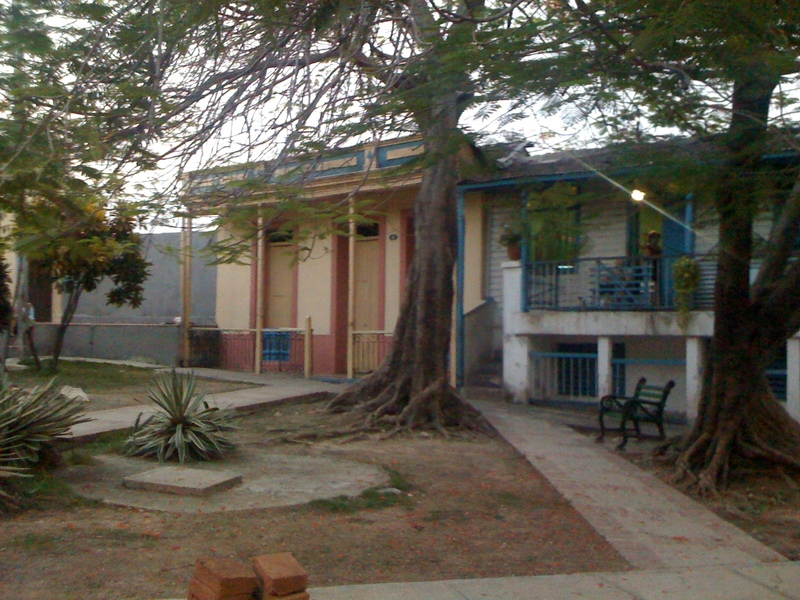 Fidel Castro lived in the house on the left hand side of this picture, General Jesus Rani no.6, between 1931 and 1933 while he was studying in Santiago. The city was where Castro led his first uprising on 26 July 1953. When Batista finally fled, Castro announced on 1 January 1959 that the revolution had been succesful in Santiago’s Town Hall. 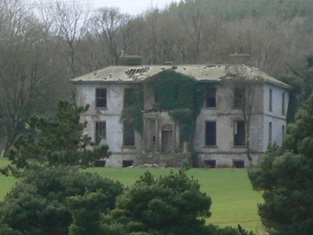 The house above is currently used as a domestic residence by a private family and there is no plaque to mark the site. Without our guide-book we would have passed by the spot without even knowing who had lived there. A capstan is used for winding in a rope with a large load on the end. 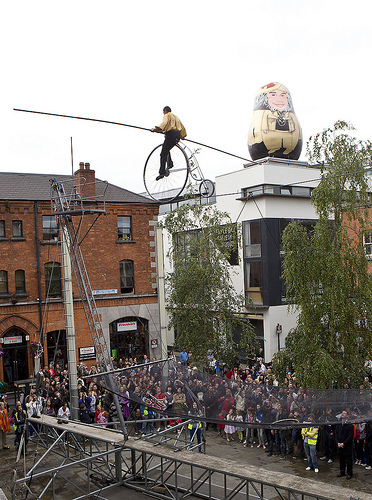 It has a vertical axle, allowing many people to throw their weight on the bars. 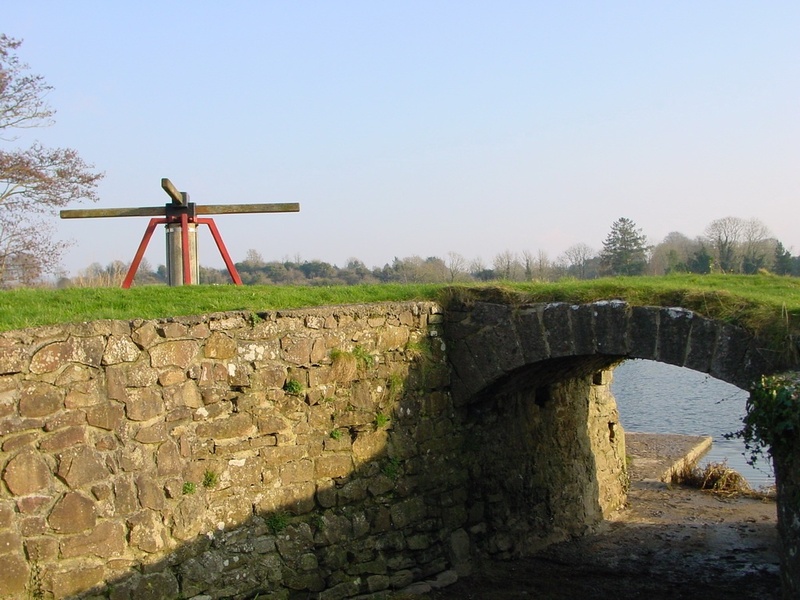 There is a capstan just upstream of the bridge crossing the Shannon at O’Briensbridge in Co Clare. From the late eighteenth century until Ardnacrusha power station was built in the 1920s, the Limerick Navigation ran under the bridge, linking the Shannon Estuary to Lough Derg. There was a three-knot current through the bridge, very difficult for boats (which were poled, rowed or sailed) to get through. Horses could not help because the navigation arch, the one that boats had to go through, was the fourth out from the bank. That was why a capstan was installed. A rope was floated down through the navigation arch; boats coming upstream secured the rope and were hauled through the arch. Temple Bar’s Cultural Trust is currently celebrating twenty years of regeneration in Temple Bar with ten days of festivities which kicked off on Friday. It hardly needs to be said that the area is one of the finest examples of urban regeneration within in Ireland and Temple Bar Cultural Trust has spearheaded and promoted numerous cultural initiatives in the capital including Culture Night. True to form there is a broad range of activities to suit every age and interest, and as usual most of the events are free. Here are some in the coming week that I thought our readers would be interested in: Friday 15th-Saturday 23rd ‘Temple Bar revisited’, an exhibition which looks at the history of the area is being held in Temple Bar Gallery. Friday 15th- Saturday 24th July, ‘Conversations about Culture’ an exhibition which is being held at The Green Building. Tuesday 19th and Thursday 21st at 11 am Free walking tours of Temple Bar by local historian Pat Liddy. Monday 18th-Friday 22nd at 11 am and 3pm every day Print-Making demos will be held at Black Church print Studio with tours around the studio. Monday 18th-Sunday 24th, 1pm & 6pm, ‘Lights out listening’, a radio documentary will be aired in the Irish Landmark Trust building to recreate how people used to listen to the radio, in intimate groups. Monday 18th-Sunday 24th Friday 22nd, 2pm-4.30pm, ‘Fort Building Workshop’; Fort Architects are going to design and build a contemporary fort, venue is the Exchange. You can find the full programme here. The above image was taken last Friday when the French high wire walker Didier Pasquette performed in Bar to open the festival. Just to let you all know, we’ve lost our header for some reason and I can’t post pictures. Apologies for the gap in posts while I try to figure out what’s wrong. I don’t like to be a curmudgeon who poo-poos anything new, but…I am finding all the changes at the NLI a little bit jarring and not 100% for the better. Let’s begin with the new cafe, which I pointed out in this month’s recommendations. I have now eaten there twice this week in between reading about railway abattoirs. I am sorry to report that the prices have not come down nor has the food consistently improved. The coffee is more than 100% better which is very welcome (especially when it costs €2.50). The scones are lovely (€2.95 with jam and cream). The salad plate (€5.95 for medium, couldn’t face meat after all the cow slaughter) was pretty lackluster. It consisted of some rocket, a potato salad with zero flavor, a sort of waldorf salad with awkwardly large pieces of celery and equally little flavor and some kind of feta/tomato/cucumber salad which was, well, salty. The best part was a lovely, fresh slice of bread that it came with. I was given the reader’s discount which was supposed to be 10% but was calculated at 45 cents. That said, the sandwiches (ham sliced off the bone, €6.70) looked nice. They were the same sandwiches every day I was in, though. Vegetarians get salad or soup (€5.50). Aside from the food I was really disappointed not to see the familiar faces of the previous cafe staff. Of course it should have occurred to me that change of management would mean change of staff, but it seems silly not to have retained the people who knew all the NLI staff and many of the readers. And probably could have helped them to avoid the inevitable scrambling at the start.